“Who says you have to choose between writing and family? hristina's quote epitomizes this month's theme Balancing Life and Writing. When you visit her website http://www.christinakatz.com/ you can count six, yes, we said six different areas that she excels in. Then your eyes drift to the left and you see two beautiful people, that would be the picture of Christina and her sweet Samantha. Below, you'll find great shots of the whole family. These pictures give us a visual aid proving balance yields a great bounty. What are you goals? Are you a multi-talented-tasker, too? (Try saying that out loud three times.) How do you set priorities? Being successful in even one area of life doesn't occur by accident. If you have multiple goals, like life and a career, it requires even more. Are you just getting started? It always helps to look at a success story. If you're well on your way establishing your career/life? Stop and re-evaluate how things are going and learn where a little tweaking could make all run smoother. The best and most experienced small aircraft pilots still hold the printed checklist in their hands and walk the plane, never relying totally on memory or habit, to ensure a successful flight. In line with that, we simply couldn't pass up an opportunity to ask how Christina is able to accomplish all that she does. You'll love her answers, we did. They make a great checklist. WOW: Christina, did you believe from early on that you would be able to ‘have it all?’ Or, did you formulate a flexible plan, a strategy that allowed you to maximize possibilities as they unfolded before you? 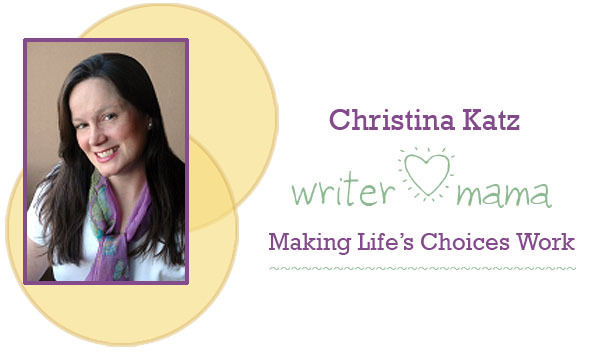 CHRISTINA: In Writer Mama, I advocate using babysteps to get from where you are to where you'd like to be. As a mama writer, I use this strategy every single day. Maximizing possibilities as they unfold is a big part of that process and so is trusting my gut, envisioning possibilities that maximize my strengths, and aligning my success with what feels like my highest good. This may sounds esoteric but as a daily practice it simply means remembering to ask, “What is the next single most important action?” and then following through. The tasks on my plate today are different from what they were a year ago. Change and growth are constants for self-employed women, not just writers. I say, find your rhythm as you go; don't follow a formula. “What is the next single most important action?” and then following through. WOW: We spoke of a checklist, and that's some sound advice to get us going. Before going any further, for those who don't know, Christina is an experienced freelance journalist, writing instructor, wife, and mother. Whew! Obviously, instead of all you do draining you, you have found a way to draw energy from these endeavors. What we want to do is tap into how you do this. Let's start with your order of priorities in life, how does your list read? CHRISTINA: My number one priority is staying connected with my instincts. Everything else flows from there. If I can feel a connection with myself then I can also feel a connection with my husband and my daughter and my students and every single person I encounter. And if I can't, then I'm in a real pickle. Of course, I can lose that connection easily through overwork, excessive behaviors (as in too much coffee drinking), and not getting enough rest. But I can also recover my instincts quickly and easily by spending time in nature, resting in motion, taking a nap, enjoying and appreciating the life I already have, playing, catching up with friends, and other pleasurable activities. In other words, be guided by your gut and learn to take care of your connection with it. WOW: Great summaries on how to lose and recover our connections. You've made it clear that you couldn't accomplish what you have without your husband's help? How does he support you? CHRISTINA: Co-parenting is a big part of my marriage. That means that while I'm in this interview, my husband is reading my daughter three bedtime stories and then rocking her to sleep. When I was working on Writer Mama, Jason spent lots of time with Samantha that would have normally been family time or more equally traded-off. I don't think that the way we co-parent our daughter is all that unique today, but I do know that I wouldn't be happy parenting any other way. We are equal partners in everything. That means if he has a show, like he did this weekend, Samantha and I might hardly see him too. But it also means that when I have a deadline, he picks up the slack for me. And the beat goes on. WOW: We love that beat. Tell us, what do you do that encourages Jason to be there for you? How do you support him in his work? This may sound a little off subject, but it isn't because part of balancing our writing with life is still being there for others in their lives, right? CHRISTINA: I don't think it's off subject at all. In fact, I make the very same point in Writer Mama. After all, it's pretty crummy to expect a partner to support you in your dream if you don't support him. I am particularly good at lighting a fire under people. This skill is not only helpful with my students but also with my husband and daughter. My husband appreciates my fiery nature and I appreciate his sweet, sensitive nature. I often need a hug, a listener, and a calming presence, and my husband is all of these things. He often needs a listener, a pep talk, and hug. I believe our culture has moved beyond the paradigm of the self-sacrificing wife/woman for the supposed good of the family. That paradigm never worked and it's definitely time to find a more mutually supportive model. WOW: We understand you and Jason, a high school Theatre/English teacher, have work that involves more than your intellect. A long hard day can leave you both feeling drained. There must be a mindset that you and he have, a common goal for your family, that helps you refocus when it's family time. How would you describe that frame of mind? CHRISTINA: It's an interesting question. I'll share an intention that my husband and I set when we were married, seven years ago. The image was of two people resting in a boat floating down a river. I don't remember where the idea came from or whose idea it was, but we both agreed that this image was personally meaningful to us. What it says to me is that we have created a safe, supportive, revivifying space where we can rest while we move forward. And I'd say that the image is reality. When my family is home, we just like to be together, hanging out, without pressure. That's resting in the boat. The other thing that feeds us despite our hectic schedules is the fact that we both love what we do. That doesn't mean we don't have tough days or personal challenges to address and overcome. But writing and teaching, for me, and directing and teaching, for him, sustain our enthusiasm and that thread of passion encourages us to stretch and grow. Stretching and growing is what we are all about. WOW: You're right. Christina, our readers are at all stages in writing and related fields. So, tell us, when did you decide you wanted to be a writer? What steps did you take to make it happen? ...and the cute mug on this little poochie (Samantha Rose) certainly helps! For many years, the stepping-stones from practicing writer to published writer didn't exactly go in a straight line; however, after my daughter was born, I experienced a renewed sense of commitment to my writing career. It might seem like an odd time to recommit. I mean, here I was caring for an infant, my husband had gone back to school, but I simply felt like I owed it to my daughter to pursue a meaningful career. Gradually, over the years, as my daughter has grown, my writing career has grown steadily, too. WOW: Somewhere along the way, from age 10 when you knew you wanted to be a writer, you met and married Jason. That had to require learning how to balance life and writing. How did you work with this blending of your lives and passion for your careers? CHRISTINA: We met in a writing class thanks to a mutual respect and passion for Julia Cameron's book, The Artist's Way. When Jason and I bumped into each other two weeks later in a coffee shop, we started a conversation about our lives and creative paths that has been going steady ever since. We talk about what's dogging us and we try to help each other lean into our strengths to get through tough patches with our work. A key we realized a long time ago is that when things aren't going our way, it's not that things aren't right. It's that we aren't right. And we are the part of the equation that we can control. So I don't advocate “balancing” per se. I advocate whatever practices ground you the way writing or walking or naps ground me. Just talking things out, taking a family walk or a scenic drive grounds us. And everyone needs to know how to center themselves, because once you're grounded, you're on your way to healthy choices. And it's so easy to become ungrounded today. WOW: Absolutely, hence the need for a checklist. When did you begin working toward becoming a writing instructor? How much more involved, time/energy wise, were you? How did that affect what you and Jason had worked out? CHRISTINA: I didn't have to work toward becoming a writing instructor because I'd already done so much preparation by the time I started. I really more needed to allow myself to become one. I started letting myself teach after I married Jason and we moved to Washington from Colorado, so he could go to graduate school. Jason supported my decision as I supported his eventual decision to teach public school and direct high school theater. I have one of those personalities that has to teach. It's not so much teach or write; it's teach to write. Teaching is an integral part of who I am, so it would qualify as one of those activities that grounds me, not one that tires me. I find writing to be much more challenging, though I find it, like teaching, to be one of the most enjoyable activities in life. Teaching helps me write and writing helps me teach. Jason teaches in order to support his family and direct plays. There wasn't anything to work out, because it's feels like what we were meant to do. WOW: Having the right mate is vitally important, but you're showing the effort that must be applied, too. Now, where, in the stream of things, did your delightful Samantha Rose come to bless your family? Unquestionable changes for your lives, professionally and personally, accompanied her. Were you both experienced enough with life's surprises that you breezed right through becoming parents, or was it back to the drawing board for you? CHRISTINA: I don't think anybody breezes right through becoming parents, no matter how things appear to the outside world! The joke that having a baby is like a bomb going off in your living room is pretty darn accurate. We do not have any extended family living near us and Jason was a full time student when Samantha was born, so it was a challenging time, as a first child is for any family, but it was extremely joyful at the same time. I think it's like the pains of childbirth, you just forget about most of it and remember the joy. It certainly helped that we were older when she was born (I was 35 and Jason was 28), so we could roll with the sleep deprivation, constant feedings, and emotional intensity that having a baby brings. Who says you have to choose between writing and family? You don't! If I can do it, so can you! WOW: Ah, the benefits of maturity are not to be shortchanged. There is no way Angela or I could minimize what it means to have an online magazine, blog, and newsletter. Life continues to become richer, offering you opportunities to expand your fields of interest. You're capable of accepting and expending yourself, while time and need to rest, etc. remains static. How do you adjust to the added demands? CHRISTINA: Well, everything I do basically doubled this year…or maybe it tripled. I have learned along the way that partnering with like-minded others is the best way to keep synergy going when the workload is running high. Currently, my workload is clocking in at about 60 hours a week and my workweek is clocking in under 40. I refuse to run myself into the ground after working really long hours last year on Writer Mama, which I am very proud of. Suffice it to say, I'm still regrouping and readjusting the amount of work I can accomplish to my schedule. The good news is: I control the schedule. So I can make adjustments as sanity dictates. One of the ways I do this is by taking the weekend off NO MATTER WHAT. Monday mornings are busier, but happier that way. WOW: Excellent points, just excellent. Is it your schedule, mindset, values...what is it that allows you to continue to incorporate more into your life--without losing/giving up what you hold dear? CHRISTINA: Perhaps my greatest source of strength is that I know who I am. I am very right-brained and feminine-minded, which I have come to accept. I see my career as an organic, sustainable, and authentic process that I steward, more like a garden that goes through seasons than anything else. I measure my success in terms of the harvest and the daily growth. WOW: I remember that you wrote, “...when nothing is happening, we writers often spend time analyzing why things aren't going the way we'd like them to, rather than simply taking more action in the direction in which we'd like to succeed.” (WOW! italics) Correct me if I'm wrong, but I'm getting a sense that you have embraced a proactive way of life. Can you explain a proactive life style for us? CHRISTINA: I train writers into action. That's what I do. I don't spin tales of inspiration, at least not anymore, because I've found that this only promotes fantasizing about a writing career, instead of initiating one. I suggest that writers get to work and keep working until they find their personal momentum—what I call rhythm. It's not a terribly glamorous approach and I never use bait like “make a six-figure income as a writer when you do exactly what I say.” I find that to be so cheesy and out of integrity and I instantly lose respect for writers who don't emphasize the process side of this business. The reality is that, for most people, it takes time to find your rhythm and make decent money. And then sustaining that success takes lots of trial and error. And as I've said the professional landscape changes as your career grows. So I put writers through the paces the way I wish someone had put me through them. In Writer Mama, I encourage writers to do that for themselves or work with the book in a writing group or circle. As long as it keeps working, I'll keep doing it. A few laps around the dog park a couple of times a day doesn't hurt either, according to pups Daisy and Izzy. WOW: Now, that you have your act all together, the unexpected, deadlines, pressure, and stress from all sides no longer get to you, right? Uh, in case I'm wrong, what do you do when you find you've lost your balance? CHRISTINA: I don't have my act all together. I'm probably going to need a personal assistant by the end of the summer because the amount of work has exceeded the amount of womanpower. And I have volunteers for my publications, but not enough time to give them assignments. What can you do? I could give you a much longer list of the things going well at this moment, but I'll let you visit my blog where I post that kind of news. For sanity, I take the weekends off and rest and clean the house and grocery shop and go to the dog park and take walks, mostly with my family. If I want to really rest, I read Entertainment Weekly in the tub or get a pedicure or do some shopping not related to work. I swear some day I will be reading novels again, which for me is one of the greatest pleasures in life, but probably not until my daughter starts grade school. She'll be in kindergarten next year, which means I will have the same absurdly staccato schedule that I do now. You have to enjoy the small stuff. For me, that's my daughter running into my arms when I walk over to school to pick her up. I mean seriously, what could possibly be better than that? WOW: Speaking of losing your balance, how steady was your walk after being invited to be interviewed by Diane Sawyer on “Good Morning America?” What a compliment and milestone for you. We can certainly understand, after all you've shared with us today, why they chose you. What do you remember most about that adventure? CHRISTINA: Let's see…I didn't sleep for about a week. I didn't have any clothes in my closet that fit me. I didn't have a babysitter. I was living in a new town and didn't know a soul. That list goes on and on. But it's trumped by the quirky stuff. Thinking the e-mail from the producer was SPAM until he called me on the phone. The moment my father-in-law suggested that I ask the producer to let me bring Samantha. Him saying yes. Flying across the country with a two-year-old. Chatting with an incredible movie producer on the plane about our kids. My husband's aunt meeting us in the city and swooping us around NYC with her crazy driving. Tony Danza saying my daughter is so cute. My husband telling his very first class of high school students to come in, sit down, and shush because his wife was about to come on the air on Good Morning America. Samantha having a melt-down on the set. You know, memorable stuff like that. Career-wise, it was very positive, but it's the real-life details that I remember most. Not the shiny packaging. WOW: In SoCal, we call that an e-ticket ride. Wow! But you landed on your feet. Thank you so much for sharing your life's wisdom and secrets with us. Are there any closing comments you would like to make? CHRISTINA: Being a life-long learner makes me feel alive because I have always loved school. Fortunately for me, there is always more to learn in a writing career and there are always new directions to explore. I think writers can benefit from a love of learning because the influx of new thoughts creates synergy and momentum. Writing conferences are great places to activate your writing career. Writing classes, specific to what you want to accomplish, can be extremely helpful. And finding and connecting with writing mentors and then sharing what you have learned as you grow—all of these things have been career catalysts for me. There will always be more to learn tomorrow and learning with others is the cure for isolation, which has historically crippled writing careers and writers. I'm a big advocate of connecting with other writers in educational environments. WOW's closing comments: We spoke a few times about making a checklist, no matter where you are in your career; we encourage everyone to go back over this with a very personal eye and write down the tips that will keep you on the path to a balanced life and writing. We certainly will. Thank you again, Christina, we appreciate all that you did to make this interview possible. Author Christina Katz balances writing with motherhood in the suburbs of Portland, Oregon with daughter Samantha, husband Jason, two dogs, three cats, and assorted fish. She has written over two hundred articles for magazines, newspapers, and online publications and has appeared on Good Morning America. Christina is editor and publisher of the online zines Writers on the Rise (www.writersontherise.com) and The Writer Mama (www.thewritermama.com). She teaches and speaks at MFA programs, writing associations, and writing conferences around the U.S and blogs daily at http://thewritermama.wordpress.com/.